A packed and captivated audience in the MBL room. 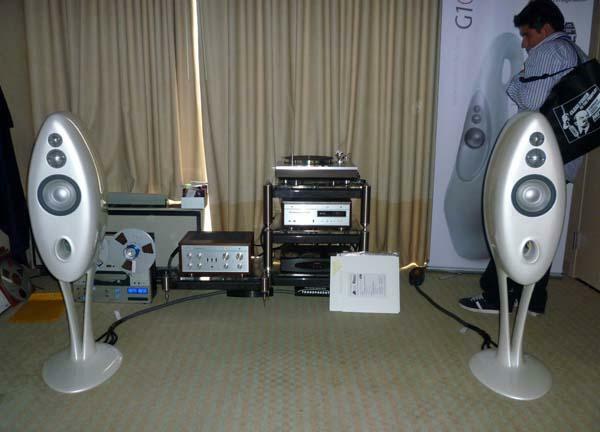 I was delighted to see so many people at the 2011 California Audio Show so attentively listening to music, as though listening to music on the hi-fi in 2011 is as much of an event as watching an episode of “True Blood” on Sunday night, or attending a concert at a music hall. Of course, we know that listening to music on the hi-fi is a special event, an active, enriching, and entertaining experience, worthy of our time and energy for the joy and nourishment it brings our minds and souls. It’s a lot of fun. 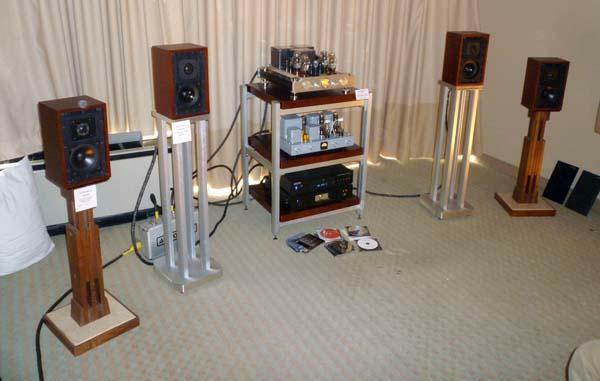 If you were present at the California Audio Show, you experienced this. 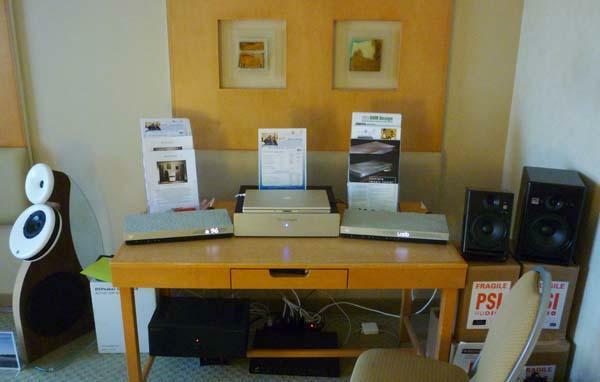 While many exhibitors at the California Audio Show struggled with the sound of their rooms, employing careful, creative speaker placement and a variety of room acoustics treatments, SimpliFi Audio’s Tim Ryan seemed happy to ignore the room altogether. 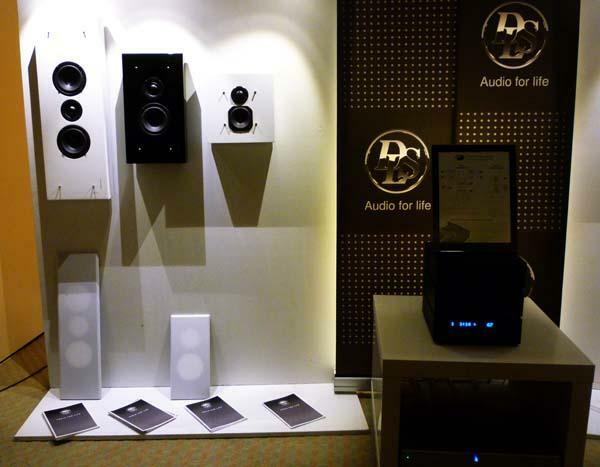 Made in Sweden and now represented in the US by SimpliFi Audio, the DLS Flatbox on-wall loudspeakers come in five sizes (Mini, far right: $249 each; Midi, center: $349 each; Slim Large; Large; and XL, far left: $499 each), can be hung horizontally or vertically, and are available in variations of white and black cabinets and grilles. 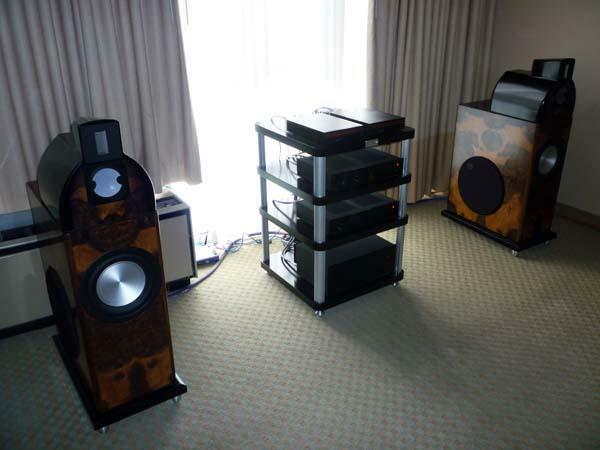 There are also three subwoofers, including the Flatsub8 ($799), used in the room. Partnered with Resolution Audio’s Opus 21 system and inexpensive DNM cables, the speakers threw a surprisingly wide stage, despite being mounted on temporary plywood walls. As we went up the line, I noted greater bass extension, but the Midi version seemed best balanced with the room and subwoofer. I walked into the Margules room and was welcomed by Peter Frampton’s funny cover of Soundgarden’s late grunge-era hit, “Black Hole Sun,” with all the fuzzy, phasey, talk boxy effects you might expect from Frampton held perfectly in check, well-focused within the wide soundstage. 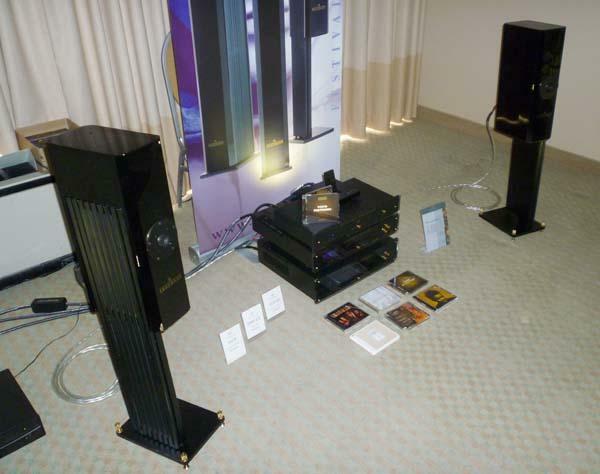 The attractive Fritz Speakers Carbon 7 ($1750/pair) were matched with ModWright KWA 100SE power amplifier ($3995), ModWright LS 100 tube preamplifier ($3495), Esoteric SA60 universal disc player ($4995), Zesto Audio Andros PS1 MM/MC phono stage ($3900), and Thorens TD 309 turntable ($1900). WyWires provided the speaker cables ($1299), interconnects ($849-$1299), and power cords ($329). 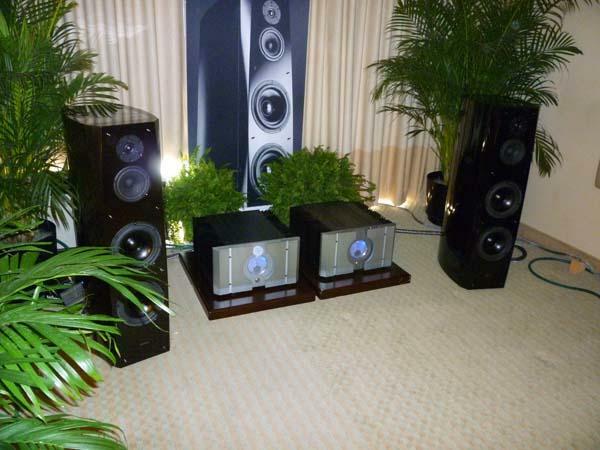 Room treatment was by GIK Acoustics and ASC. Steve Blinn Designs contributed the equipment rack ($1899). Billie Holiday’s Songs for Distingué Lovers (priceless) provided the mood. We listened to a track from Nat King Cole’s Love is the Thing, a beautiful 45rpm reissue from Chad Kassem’s Analogue Productions. 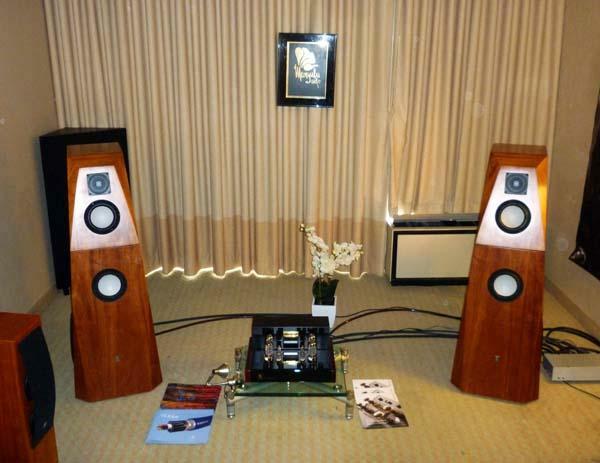 There was a jovial, festive vibe in Philip O’Hanlon’s On A Higher Note room, featuring Luxman amplification and source components, Vivid loudspeakers, and music courtesy show attendee, Raymond. As I walked into the room, O’Hanlon explained that Raymond had been knocking everyone’s socks off with his vinyl selections. Raymond dug through his bag of vinyl and handed O’Hanlon a record. 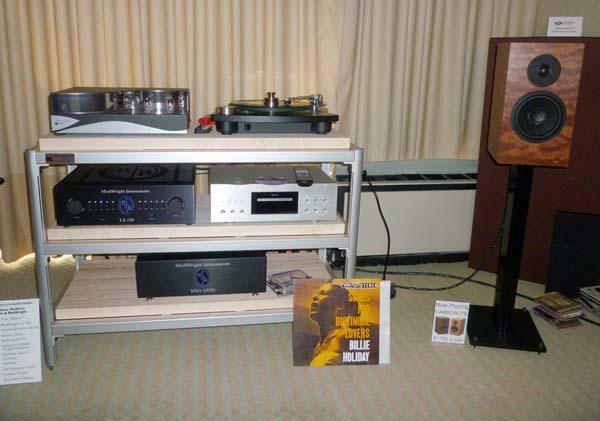 The charming host took that record and placed it on Luxman’s PD-171 belt-drive turntable ($6200, including tonearm and dustcover), the first turntable to come from the Japanese company in 28 years. 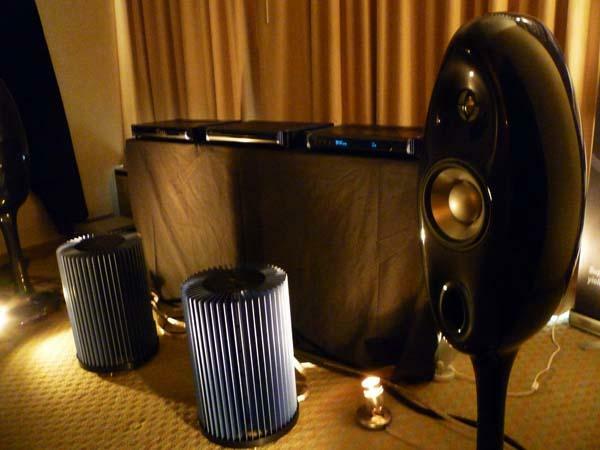 This system offered a bold, vibrant sound when the music called for it, a gentle, subtle sound when the music called for it, and always exhibited a good sense of momentum and flow. 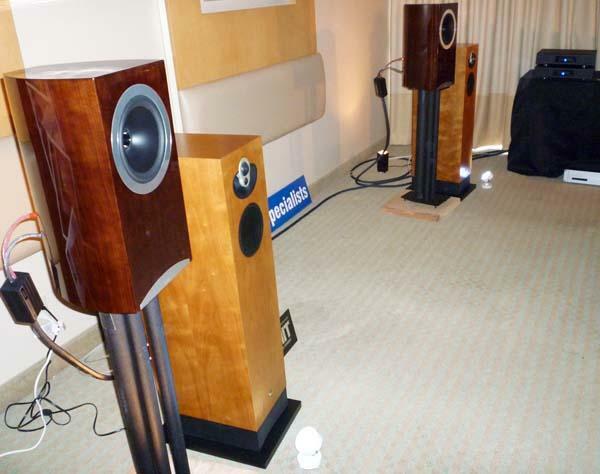 I noted deep silences, good spatial effects, good low-end impact, and a fine sense of scale in this room occupied by Salk Sound and Van Alstine: Salk Sound Soundscape loudspeakers ($12,000/pair) and 300Wpc Van Alstine hybrid amplifier ($3000). Jon Iverson might also like this. I noted generous scale, midrange detail, full body, and an overall effortlessness to the presentation of this system: Wilson Sophia loudspeakers, Pass Labs amplification, and the new Light Harmonic Da Vinci 384K USB DAC ($15,000 [NOTE: The actual retail price ended up at $20k-ed.]). Jon Iverson might like this. Widea Lab is a young Korean company. The company says they’ve got some strong candidates for US distribution and will also be selling via Amazon. 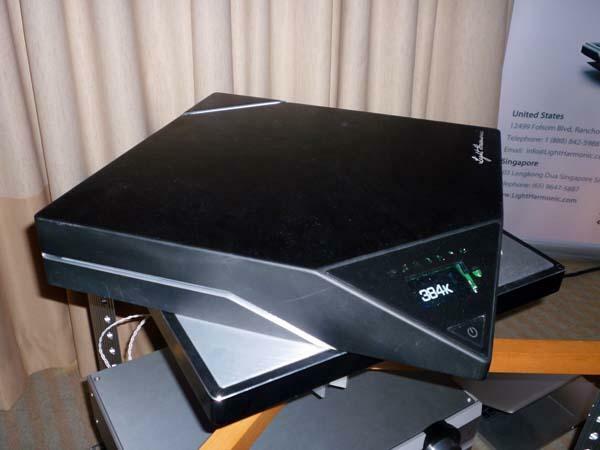 Their first product, the Aurender (short for Audio Renderer; $5700), is a digital music server utilizing a customized Linux OS, linear power supply, and storage for over 5000 lossless and uncompressed CDs. Also in the Gini Systems/Audio Space room was the Gini iTube 2.1 Audio System ($199, show price). 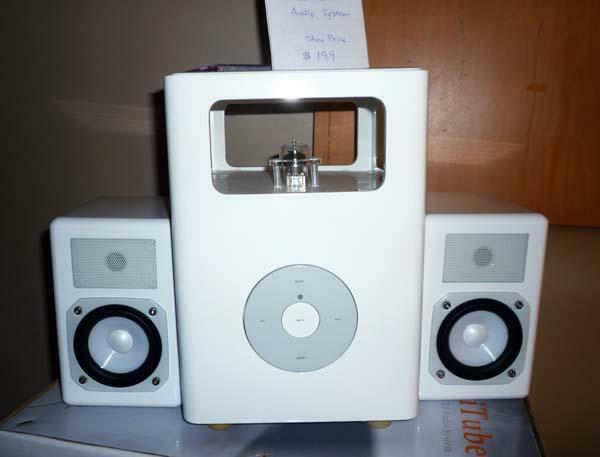 As you can see, it looks like a big iPod with a little tube and speakers. 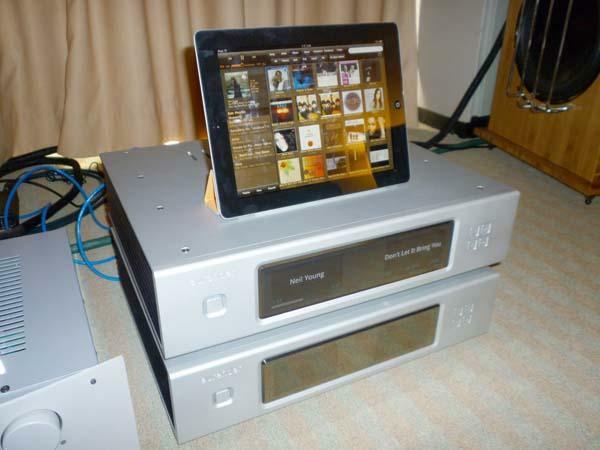 A gentle, relaxed sound with well-focused images was coming from the Gini Systems/Audio Space room: Audio Space LS3/5a monitors ($1790/pair), Reference 3.1 300B integrated amplifier with tubed moving-magnet phono stage ($4290), DAC-US1 D/A converter ($2500), and CDP320 player ($800).